In 2014, a 20-year-old grizzly bear named Ethyl made an epic 2,800 mile walkabout through Montana and Idaho. U.S. Fish and Wildlife Service biologists knew of her movements because of the GPS collar she wore, which sent weekly data to a satellite. Federal Grizzly Bear Recovery Coordinator Chris Servheen called her traverse into Idaho via the Bob Marshall Wilderness and Mission Mountains, which involved navigating through main streets, landfills, backyards and crossing Interstate 90, "bizarre." While male grizzlies make big movements, females rarely venture far. Yet this was but one of several similar carnivore peregrinations documented in the last fifteen years via GPS-collar technology. For example, in early 2003, a two-year-old male lynx stepped into a trap set in British Columbia to capture individuals for a Colorado lynx reintroduction. Wildlife biologists fastened a GPS collar around his neck and transported him to Colorado's high country. Soon after being released, he found a mate, eventually siring three litters of kittens. Life was good, but in 2006 something made him feel like roaming. He eventually trekked 2,000 miles to Banff National Park, Alberta, amazingly close to where he was born. His life ended there in another trapline -- a lethal one set to legally harvest fur-bearing mammals. Superbly healthy at the time of his death, he set a world record for the greatest-known distance covered by one of his kind. Despite his tragic end, he proved that even in our fractured world, it's possible for a carnivore to roam widely. Other carnivores have followed. In February 2008 while doing a marten study near Lake Tahoe, Oregon State University graduate student Katie Moriarty photographed a wolverine with her trail camera. California's first substantiated wolverine sighting since the 1920s, the grainy image created a furor. Genetically related to Rocky Mountain wolverines, the animal had dispersed at least 900 miles. Then there was the young male cougar who in 2011 made a 1,500 meander from the South Dakota Black Hills to suburban Connecticut, looking for new prospects, only to become roadkill. 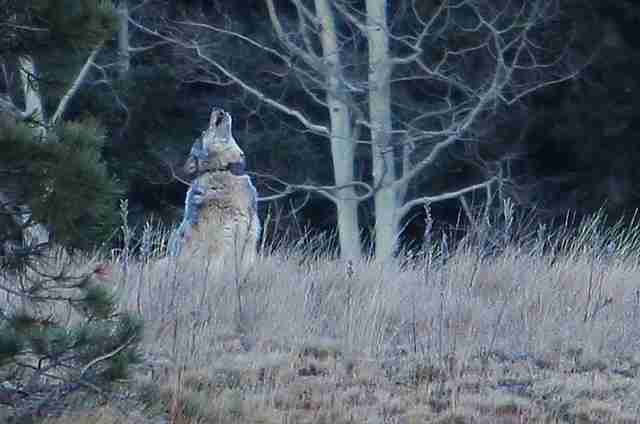 Or the female wolf who in late 2014 wandered from the Greater Yellowstone Ecosystem to the Grand Canyon, wearing an inactive radio collar. DNA tests revealed that she was a pure wild wolf. 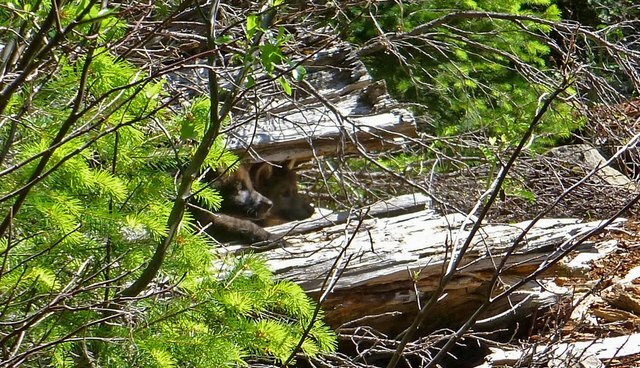 One of the most compelling dispersals began in September 2011, when a young male wolf left northeast Oregon's Imnaha pack. Called OR7 by the state wildlife managers and popularly dubbed Journey, he drew public attention as he rambled around Oregon, searching for a mate. In late 2011, he dropped into California and became the first wolf confirmed there since 1924. He then proceeded to prey on wild game and ignore livestock -- no small feat for a young male with raging hormones. In early 2014, he routinely slipped between California and Oregon, providing a vivid example that carnivores don't recognize legal land boundaries. Then as people seriously wondered whether OR7 was looking for love in all the wrong places, he found a mate in southern Oregon and produced pups. These transboundary stories make our hearts beat a little faster and give rise to complex emotions: wonder, grief, hope. How many other such dispersals of which we are unaware have there been? Why do so many have tragic endings? And how can we improve the outcomes, now that we're aware that these dispersals do occur? Audacious as such dispersals may seem, these peripatetic carnivores can't help making them. This behavior is imprinted in their DNA, in the shape of their bodies, and in how their minds work. Moreover, they do it with casual grace, as if such heroic dispersals amounted to just another day in their lives. There goes a wolf, loping a thousand miles in a harmonic, energy-conserving gait, its hind feet falling perfectly into the tracks left by its front feet. And a wolverine, effortlessly running up mountains and back down in minutes, covering more ground and elevation more rapidly than any other terrestrial mammal. If such behavior were a simple act of will, most of these stories would have happy endings. But nevertheless, these dispersals fill me with hope that perhaps we'll soon get it right, given the opportunities and powerful lessons these animals are providing. 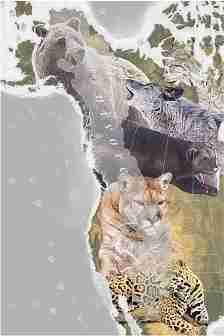 In the North American West, the primary corridor carnivores have been using for dispersal since the end of the last ice age extends from Alaska to Mexico. Twelve thousand years ago, two ice sheets covered much of this continent. As they melted, a path opened between them, enabling passage of creatures such as grizzly bears. Today, animals continue to use this ancient corridor. Indeed, I like to think of it as a "carnivore way," because of the carnivores who have worn deep trails in this pathway over millennia. Obstacles to this basic need to roam, such as human development, can provide formidable threats to long-term survival of many species. For the large carnivores, it's not just about losing the freedom to move, it's about losing a natural process. They and other species use dispersal as a key survival mechanism, to maintain genetic diversity and adapt to climate change. To learn more about the challenges grizzly bears, wolves, wolverines, lynx, jaguars, and cougars face, in 2013 I traveled the Carnivore Way. I talked to dozens of ecologists, ranchers, and conservationists, and immersed myself in the landscapes these animals inhabit. These travels formed the basis for my recent Island Press book, The Carnivore Way: Coexisting with and Conserving North America's Predators. In future posts, I'll share some of these species' stories and the astonishing lessons I learned along the way.